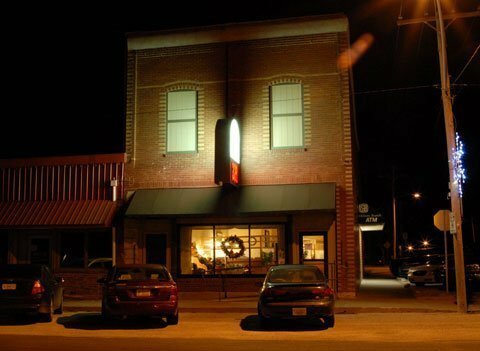 The two-story red brick building located at the corner of Main and Emporia streets in Melvern began life early in the 1900s. Now the Melvern Branch of Lyndon State Bank, this structure housed the Melvern State Bank from 1908 to 1933. The building boasted beautiful quarter-sawn oak teller areas highlighted with filigree metal work and frosted glass and 14-foot high decorated ceilings. Outfitted with hitching posts and a gas lamp out front, this stately structure was a showcase in the bustling railroad town. Melvern State Bank did a brisk business for 25 years, serving residents throughout a wide area. The bank failed in March 1933, and sadly, the doors were closed. The bank president was distraught knowing what the closing meant to his community and committed suicide shortly after. When the bank closed the teller cages were dismantled and put in storage. Its use as a bank was over for a very long time. Over the span of the next 55 years the building housed many small businesses such as a real estate office, insurance office, beauty shop, doctor’s office and ‘gentlemen’s apartments’. The top floor of the building was reached by a stately staircase accessed from the sidewalk on Main Street. The rooms upstairs were used by the Masonic Lodge, Eastern Star and Job’s Daughters for meetings and dances. Many secretive gatherings were held in the large meeting room outfitted with an elevated stage area and floor to ceiling windows. Some residents remember as young children watching a parade of local women in elegant evening gowns ascending the long staircase to attend events. The Lyndon State Bank, owned by the Clyde Burns family, purchased the building in 1988 and restored the main floor back to its original glory. The teller cages were reinstalled and the main floor redecorated in a style reminiscent of the early 1900s, yet with modern conveniences. The very unique double oak desk found in the teller area has been in constant use for over a century. The original safe was retooled and a modern security system installed. 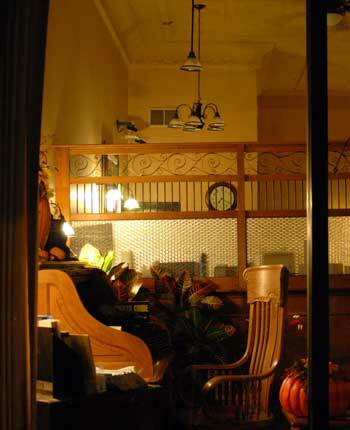 The lobby is also home to a beautiful 100-year-old roll-top desk and small safe that was used in the R.W. Smith Store in Melvern since 1913. These items were donated by the Bob McNabb family, descendents of the original owners. The Melvern Branch of the Lyndon State Bank is now a full-service branch bank, employing two full-time and two part-time employees. Stepping into the bank is like stepping back in time. Drop by this historic jewel and experience it for yourself. The Melvern Branch of Lyndon State Bank is at 102 S. Main St., Melvern. Do you know of a unique or interesting place in Osage County? Email information and photos to [email protected].